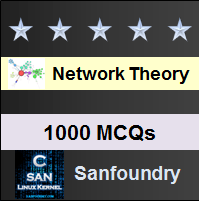 This set of Network Theory Multiple Choice Questions & Answers (MCQs) focuses on “Supernode Analysis”. 1.Consider the figure shown below. Find the voltage (V) at node 1. Explanation: Applying Super Node Analysis, the combined equation of node 1 and node 2 is (V1-V3)/3+3+(V2-V3)/1-6+V2/5=0. At node 3, (V3-V1)/3+(V3-V2)/1+V3/2=0. Also V1-V2=10. On solving above equations, we get V1= 13.72V ≈ 14V. 2. In the figure shown in the question 1 find the voltage (V) at node 2. Explanation: Applying Super Node Analysis, the combined equation of node 1 and node 2 is (V1-V3)/3+3+(V2-V3)/1-6+V2/5=0. At node 3, (V3-V1)/3+(V3-V2)/1+V3/2=0. Also V1-V2=10. On solving above equations, we get V2 = 3.72V ≈ 4V. 3. In the figure shown in the question 1 find the voltage (V) at node 3. Explanation: Applying Super Node Analysis, the combined equation of node 1 and node 2 is (V1-V3)/3+3+(V2-V3)/1-6+V2/5=0. At node 3, (V3-V1)/3+(V3-V2)/1+V3/2=0. Also V1-V2=10. On solving above equations, we get V3 = 4.5V. 4. In the figure shown in the question 1 find the power (W) delivered by the source 6A. Explanation: The term power is defined as the product of voltage and current and the power delivered by the source (6A) = V2x6 = 3.72×6 =22.32W. Explanation: The equation at node 1 is 10= V1/3+(V1-V2)/2. According to super Node analysis, (V1-V2)/2=V2/1+(V3-10)/5+V3/2V2-V3=20. On solving, we get, V1=19V. 6. 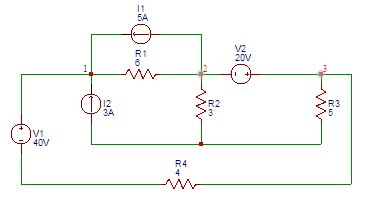 Find the voltage (V) at node 2 of the circuit shown in the question 5. According to super Node analysis, (V1-V2)/2=V2/1+(V3-10)/5+V3/2V2-V3=20. On solving, we get, V2=11.5V. 7. Find the voltage (V) at node 3 in the figure shown below. Explanation: At node 1, (V1-40-V3)/4+(V1-V2)/6-3-5=0. Applying Super Node Analysis at node 2 and 3, (V2-V1)/6+5+V2/3+V3/5+(V3+40-V1)/4=0. Also V3-V2=20. On solving above equations, V3 = 18.11V ≈ 18V. 8. 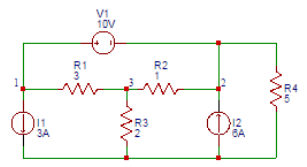 Find the power absorbed by 5Ω resistor in the figure shown in the question 7. Explanation: The current through 5Ω resistor = V3/5=18.11/5=3.62A. The power absorbed by 5Ω resistor = (3.62)2 )×5=65.52W. 9. Find the value of the voltage (V) in the equivalent voltage source of the current source shown below. Explanation: The value of the voltage (V) in the equivalent voltage source of the current source the voltage across the terminals A and B is (6)( 5) = 30V. 10. Find the value of the current (A) in the equivalent current source of the voltage source shown below. Explanation: The value of the current (A) in the equivalent current source of the voltage source the short circuit current at the terminals A and B is I=60/30=2A.